Well, on the West coast it is still before midnight, therefore, I still have time to post my FFF’s! Today’s offering is all about my love of paper and books. People discard the most wonderful things. A few weeks ago I came across these book plates. There was a huge box of several different kinds near the dumpster at my friend Anne’s studio. I took what I thought was a lot, she took some. When I brought them home I got the idea to make pads of paper for notes. I used PVA glue thinly applied to the top edge of a clamped set of papers. It worked! I will also use some of the images for collage or ?, too. I went back the next day to see if I could snag the rest, but they were gone. 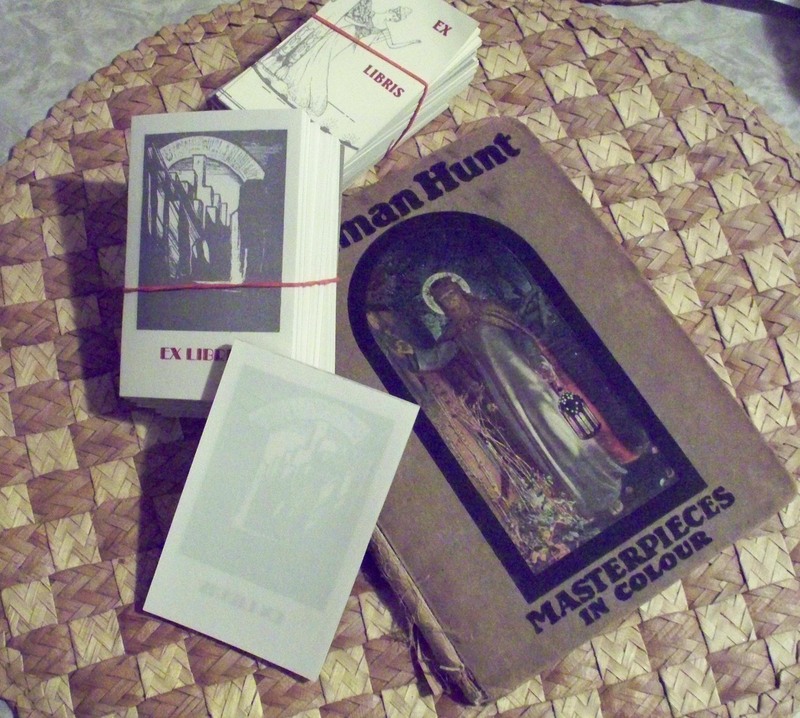 The book about Holman Hunt was found by Anne near the same dumpster. She gave it to me! What a sweet thing to do. It has some beautiful color plates inside. Before I alter it or cut it up, I feel compelled to read it. I was taught to respect books. Do you have trouble defacing, or cutting up books like I do? I’ll just have to get over it! This entry was posted on August 10, 2012 at 11:51 pm and is filed under altered books, Art parts, Artist Books, Found Objects with tags altered books, artist book, artist's books, book plates, books, found treasures, holman hunt, trash into treasures. You can follow any responses to this entry through the RSS 2.0 feed. You can leave a response, or trackback from your own site. I used to have a BIG problem ripping books, having worked in a book shop (my dream job) I respected books. Until, I discovered altered books and I had to rip pages and stick pages together it was hard. Now I don’t feel so bad after all I am recycling ….